Place 4 bouillon cubes in a large pot and cover with 4 cups water. Turn the stove on to boil and add the vegetables frozen (spinach and onion) and raw (one bunch of celery) so that the flavors seep as it boils. Stir occasionally so that the bouillon separates and the vegetables get mixed together and the flavors seep. When the soup begins to boil, let it continue for about 5 minutes. Turn the stove to simmer and let the soup simmer for another 10-15 minutes until the celery is very fragrant. Add pepper to taste and enjoy. 641 members have added this recipe to their cookbook. How much grams there are in 1 serving? I tried this and loved it... was very filling. Very easy to make. I added garlic. It's delicious and super easy to make. I didn't have frozen onions so chopped up one and sauteed it first in a little butter. Then I simmered everything together until the celery was soft and ran it through the blender before serving. sounds delicious, healthy, and easy ! ! ! ! ! Very yummy, very easy, very good for you:). Do you think this recipe is good for Ladyphattie's own diet? 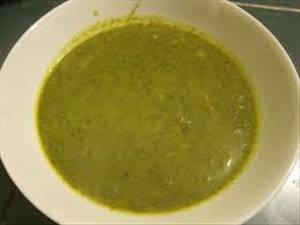 There are 43 calories in 1 serving of Celery, Onion and Spinach Soup. Calorie break-down: 12% fat, 63% carbs, 25% protein. 1 other member has added this recipe to their cookbook for Ladyphattie's own diet.